Since solar panels can last twenty-five years or more, your panel choices now can impact your cost savings and solar energy production in the future. Selecting the right panel is a great way to tailor your new solar system to your energy needs and budget. 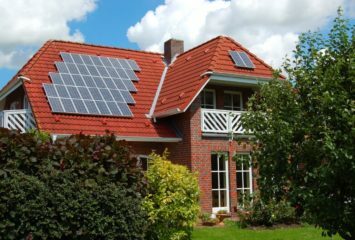 We’ll first address what efficiency is in regards to solar and how it’s important, and then we’ll address the various solar panel types to help you choose the perfect one for your situation. Solar panel technology is one of the fastest-developing areas of the renewable energy sector. Every year, new materials, manufacturing techniques, and designs push the boundaries of panel efficiency. This means that homeowners have never had a wider selection of options when it comes to solar panels. Solar panel materials and designs can vary, but all panels serve the same purpose. Using special materials, solar panels generate electrons when exposed to light, and these electrons are then converted to electricity for your home. The efficiency of a solar panel refers to the amount of electricity the panel generates from light. Most panels fall somewhere between 9% and 20% efficiency.1 The rest of the energy is lost as heat. Still, the average solar panel is efficient enough to be reasonably cost effective. Efficiency differs between different panel designs, and highly efficient panels often come at a greater cost. However, you’ll need to find the best value for your dollar when considering the immediate and long-term priorities of your system—and it may not be the most efficient panel available. As said before, solar panels vary broadly in their design and quality, even within a single manufacturer’s line. However, most panels fall into one of three categories: monocrystalline, polycrystalline, or thin film. These three types of panels don’t share the same efficiency rates or physical characteristics, but none of the three is a clear winner in every category. Each has its own advantages and drawbacks. Of all solar panels, 90% are made using silicon as the photovoltaic material.2 Silicon is a stable, durable material that is easy to access and very efficient. Both monocrystalline and polycrystalline solar panels use silicon. But thin-film solar panels are made from other photovoltaic materials, giving them different properties from traditional, silicon-based panels. Below, we’ll dive into more detail for each panel type. Monocrystalline solar panels are the most efficient solar panels—they use a special manufacturing technique to get the most out of silicon, the parent material. In a monocrystalline panel, silicon ingots of very high purity are cut into thin wafers which are mounted in a grid shape. The panel itself appears a dark black, and each individual silicon wafer has rounded corners, giving these panels a unique look that is easy to distinguish. Because the silicon ingots used in the manufacturing of monocrystalline panels have a very high purity rating, they are exceptional at producing electricity, which results in the high efficiency ratings we mentioned earlier. The best of these panels carry an initial efficiency rating of 21.5%.3 They also require little space and perform better than other panels in low light. The biggest drawback of monocrystalline panels is their high cost; these premium panels can be significantly more expensive than other panel varieties, although costs can vary considerably across different manufacturers and panel designs. Monocrystalline solar panels also produce more waste when they’re manufactured due to the more cylindrical nature of the silicon ingots—the edges of each wafer are discarded as waste during the manufacturing process. Manufacturing polycrystalline cells is quite efficient, which dramatically cuts costs to make these much cheaper to produce than monocrystalline cells. Polycrystalline panels use melted silicon, which is poured and cut into perfectly square wafers. This melting process uses just about all the material, eliminating abundant waste during manufacturing. While these panels are reasonably efficient—usually falling between 13% and 16% efficiency—they rarely match the efficiency of monocrystalline panels,4 and they don’t perform as well in high-heat or in low-light conditions. Polycrystalline panels also tend to be larger, and their shimmering blue color can be less aesthetically pleasing than thin-film and monocrystalline panels. Thin-film solar cells are not made from silicon like other panel varieties. These solar panels use alternative photovoltaic mediums that are deposited in a thin layer over a substrate. This unique structure allows for some distinctive panel characteristics. Thin-film solar panels are most often manufactured from cadmium telluride (CdTe), amorphous silicon (a-Si), copper indium gallium selenide (CIS/CIGS), or organic photovoltaic cells (OPC). While not quite as efficient as polycrystalline or monocrystalline panels—with a median efficiency of 15% or 16%—thin-film panels are very easy to manufacture and can be produced using a flexible substrate, broadening their applications.5 Thin-film solar cells are also very efficient in low-light and high-temperature conditions, and they can be very visually appealing in applications where traditional solar panels would stand out. Thin-film solar cell technologies have several drawbacks that have limited their use, especially in the residential sector. In addition to their low efficiency ratings, these solar cells have large space requirements, making them impractical for most roof layouts. They can also be less stable, degrading over a shorter time period than traditional panels. Cadmium Telluride (CdTe) cells show the greatest potential for thin-film solar panels. This material is the only variety of thin-film solar panel to have surpassed traditional panels in cost efficiency, and several very recent breakthroughs in efficiency are opening new doors for development that may make CdTe panels even less expensive. Their simple and efficient manufacturing process could lead to a new generation of solar panels that use less materials and energy when produced, making solar power even greener. 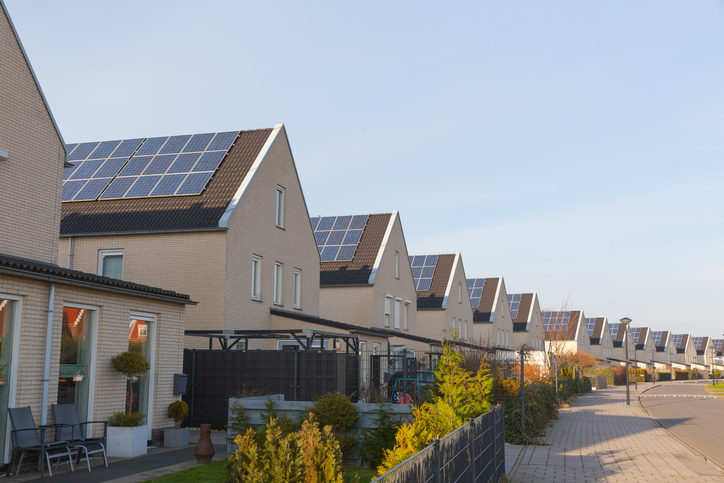 Where Is Residential Solar Headed? Solar panel development is a rapidly evolving field. New technologies are being developed each year that offer increased solar efficiency, faster and cheaper manufacturing, and better long-term durability. The newest technology in the solar market is the concentrator photovoltaic (CPV) panel. Developed by the GW School of Engineering and Science, CPV panels shatter previous barriers to solar efficiency with a whopping 44.5% conversion rate.6 Using crystalline lenses, these panels focus sunlight onto very tiny photovoltaic cells that are stacked on top of each other. As concentrated sunlight passes through multiple photovoltaic cells, several wavelengths of light are captured, resulting in the impressive efficiency rating. Right now, CPV technology is too expensive to mass-produce for consumers. However, breakthroughs like CPV panels are frequent—the next generation of solar technology might soon be found on the roof of your home. Which Solar Panels Work Best for Your Home? Choosing the solar panel that’s right for you depends on the characteristics you value most. Each solar panel variety excels for a certain niche, and their varying features can help you tailor your system to your energy needs. For homes with limited roof space or partial shading, monocrystalline panels are a strong choice. These panels produce the most electricity using the smallest amount of roof space. They work well in adverse conditions, making them ideal for customers in extreme climates. They’re also a great choice for homeowners who value long-term savings over lower initial cost. If the initial cost of your solar system is your biggest barrier, polycrystalline panels offer the best bang for your buck. These panels won’t be quite as efficient, but their lower initial cost can help you generate solar electricity sooner, rather than later. Their manufacturing process also produces less waste than monocrystalline panels, making them attractive to environmentally conscious homeowners. Thin-film panels are attractive for customers with no space constraints and a tight budget, since they’re more cost-effective than silicon panels. Ground-mounted thin-film solar systems are common and often placed in large fields or open spaces. Thin-film panels are also a good choice if the environmental costs of manufacturing are a major concern. CdTe cells are the technology to watch for in the future of solar panel development. While panel materials dictate most of a solar panel’s characteristics, there is still a great deal of variety from panel to panel. Look closely at the manufacturer’s efficiency ratings, warranties, and other design elements—like micro-inverters or mounting systems without racks—when choosing between solar panels. These design elements can make a big difference when it comes to matching a panel to your energy usage, your home’s roof specifications, and your budget. 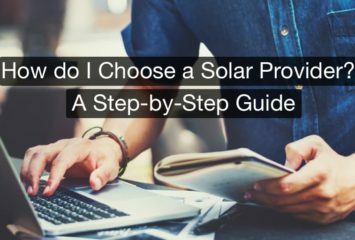 Look to your local solar installation experts to guide you through the process of panel selection and ensure you’ll be happy with your choice for decades after you install your system.